Was Jupiter (as Part of a Series of Extraordinary Astronomical Events Occurring in 3 B.C. – 2 B.C.) the Christmas Star? Was Jupiter (as part of a series of extraordinary astronomical events occurring in 3 B.C. – 2 B.C.) the Christmas “star” (aster) that led the Magi from the east to Bethlehem? Most notably, beginning in 3 B.C., Jupiter (the King Planet) and Regulus (the King Star) conjoined three times in the Leo Constellation(the Lion aka the Royal Constellation). Thereafter, on June 17, 2 B.C., Jupiter (the King Planet) conjoined with Venus (the planet of love and beauty) to produce the brightest celestial light anyone alive had ever witnessed. This article examines the extent to which the Jupiter proposal adequately explains, or fails to explain, the facts revealed about the “star” in Matthew 2:1-11. The article also summarizes the criticisms that have been waged against the proposal as well as how proponents of the proposal respond to those criticisms. Astronomical Events Occurring in 3 B.C. – 2 B.C.) the Christmas Star (Aster)? According to Matthew 2:1-11, after Jesus was born, Magi from the east traveled to Jerusalem and met with King Herod saying: “Where is the one who has been born king of the Jews? We saw his star [aster] in the east and have come to worship him.”After the chief priests and teachers of the law reported that Micah the prophet had prophesied the Messiah would be born in Bethlehem (see, Micah 5:2), the Magi left Jerusalem heading south toward Bethlehem and the “star they had seen when it rose went ahead of them until it stopped over the place where the child was”(Matt. 2:9). Matthew 2:10 says that when the Magi saw the star, “they were overjoyed”. Although “aster” has been traditionally translated into English as “star”, the Greek word “aster” is a more general term which “can refer to any kind of heavenly body – a star, a planet, an asteroid, a comet, or a meteor. [Hugh Ross, “The Christmas Star” www.reasons.org (updated 2010); see also, Barry Setterfield, The Christmas Star, DVD (2008), Joseph Henry Thayer, A Greek-English Lexicon of the New Testament, 81 – 82 (Grand Rapids, MI: Baker, 1977) and www.teknia.com/greek-dictionary/aster]. Given the broader definition of the Greek word “aster”, as compared to the English word “star”, some scholars propose that Jupiter (as part of a series of extraordinary astronomical events occurring in 3 B.C.– 2 B.C.) is a strong candidate for the Christmas “star” (aster). In 1991, Ernest Martin (a meteorologist and archaeologist) further developed the Jupiter proposal by noting that Jupiter not only conjoined with Venus in the Leo Constellation in 2 B.C., but had participated in a series of extraordinary astronomical events between 3 B.C. – 2 B.C. The totality of these events is what Martin contended sent the Magi to Judea looking for a newborn Jewish king. [See, Ernest Martin, The Star of Bethlehem – Star that Astonished the World (1991)] A short video presentation of Martin’s explanation of the Christmas “star” (aster) can be viewed at www.askelm.com/video/v020301.htm. A 2003 edited version of the Second Edition of Martin’s book can be read free of charge at www.askelm.com/star/index.asp. More recently, Rick Larson and Barry Setterfield have produced DVDs further promoting the Jupiter proposal. Larson’s 2007 DVD entitled The Bethlehem Star can be found at www.Bethlehemstar.net. Setterfield’s 2008 presentation entitled The Christmas Starcan be found at www.setterfield.org. Recently, both presentations have been aired on television around Christmastime. Astronomical Events Occurring in 3 B.C. – 2 B.C. On August 13, 3 B.C., Jupiter (the King Planet) and Venus (the planet of love and beauty) rose before dawn and appeared so closely together that they appeared to be touching. In September, 3 B.C., Jupiter (the King Planet) had risen in the east and conjoined with Regulus (the King Star), the brightest starin the Leo Constellation (aka the Royal Constellation). Some proponents note that at the same time, the Virgo Constellation (the Virgin) rose in the east behind Leo (the Royal Constellation) and Virgo was clothed in the Sun (i.e., the sun was passing through Virgo) with a new crescent moon at her feet. Jupiter (the King Planet) conjoined with Regulus (the King Star) two more times on February 17, 2 B.C. and May 8, 2 B.C. After Jupiter (the King Planet) finished its triple conjunction with Regulus (the King Star), due to optical effects of retrograde motion, Jupiter traveled west and, on June 17, 2 B.C., Jupiter (the King Planet) conjoined with Venus (the planet of love and beauty). This conjunction was so close that, to the naked eye, the two objects appeared to be touching; technically, they were 1/50th of a degree apart. On August 27, 2 B.C., a close grouping of Jupiter, Venus, Mercury and Mars occurred before Jupiter (the King Planet) continued travelling west toward Judea. In December of 2 B.C. (when it is proposed the Magi left Jerusalem to go to Bethlehem), they saw Jupiter (the King Planet) ahead of them to the south, sitting 65° above the horizon. And, because Jupiter (the King Planet) was in retrograde, Jupiter appeared to be “stopped” over the town of Bethlehem. 7 B.C. 6 B.C. 5 B.C. 4 B.C. 3 B.C. 2 B.C. 1 B.C. As presented by Rick Larson, beginning in September of 3 B.C. (the time of Rosh Hashanah, the Jewish New Year), Jupiter (the King Planet) and Regulus (the King Star) conjoined three times in the Leo Constellation (the Royal Constellation) and the constellation which Larson states was linked to the Tribe of Judah in the nation of Israel. At the same time, the Virgo Constellation (the Virgin) rose clothed in the sun(meaning the sun was passing through Virgo) with a new crescent moon at her feet, representing Jesus’ conception. Nine months later (the term of a woman’s pregnancy) on June 17, 2 B.C., Jupiter (the King Planet) conjoined with Venus (the brightest planet and the planet of love and beauty) and, together, they produced the brightest ball of light anyone alive had ever seen which signified a birth to the Magi. The totality of these unusual astronomical events is what convinced the Magi a Jewish king had been born and sent them to Judea to pay homage to the one born king of the Jews (Matt. 2:1-2). After arriving in Jerusalem and learning Micah the prophet had prophesied the Jewish king would be born in Bethlehem (Micah 5:2), the Magi left Jerusalem and headed south to Bethlehem. Upon leaving Jerusalem on December 25, 2 B.C. at about 7:00 a.m., the Magi looked south toward Bethlehem and saw Jupiter (the King Planet) ahead of them in the southern horizon. Astonishingly, due to optical effects of retrograde motion”, Jupiterappeared “stopped“ over the town of Bethlehem. On May 19, 3 B.C., Saturn and Mercury rose closely together before dawn and on June 12, 3 B.C., Saturnrose even more closely together with Venus (the planet of love and beauty). On August 1, 3 B.C. Jupiter (the King Planet) rose helically in the rays of the dawn (i.e., it was visible a short time above the horizon before the sun rose). Then, on August 13, 3 B.C. Jupiter (the King Planet) and Venus(the planet of love and beauty) rose before dawn and appeared as one ball of light. All of this occurred in the Cancer Constellation which is at the end of the zodiac and symbolizes the end of an era. On August 18, 3 B.C. Mercury emerged from the solar glare in the early dawn standing 1/3 of 1° apart from Venus and Jupiter in the Leo Constellation (aka the Royal Constellation) which Setterfield contends was not only a symbol of the Tribe of Judah, but a symbol of the beginning of a new era. In September, 3 B.C, Jupiter (the King Planet) traced a loop around Regulus (the King Star and the brightest star in the Leo Constellation) which denoted the birth, or immanent birth, of a king of the Jews who would usher in a new era. On June 17, 2 B.C. the Magi observed the next sign in the Leo Constellation, namely, that Jupiter (the King Planet) and Venus (the planet of love and beauty) were in such close conjunction that they appeared to fuse into one ball of light for the second time in one year which no one alive had ever witnessed. On August 27, 2 B.C., after a grand meeting of Jupiter, Venus, Mercury and Mars in the Leo Constellation, Jupiter (the King Planet) continued its westward trek toward Judea. By mid-November, the Magi set off for Jerusalem looking for one born king of the Jews. When the Magi arrived in Jerusalem in December, 2 B.C., Herod (and all Jerusalem with him) were troubled (Matt. 2:3) because the Magi (who were dignitaries) would have been travelling with a large entourage of armed men and Herod’s guard was away quelling a rebellion in Armenia alongside of Caesar. On December 25, 2 B.C., after learning the Messiah was to be born in Bethlehem (Micah 5:2), the Magi left Jerusalem and headed south to Bethlehem (a journey of about 6.2 miles). As the Magi looked due south, they saw Jupiter (the newborn king’s “star”) 65° above the horizon; and, due to the optical effects of retrograde motion, Jupiter (the Christmas “star”) appeared “stopped” over the town of Bethlehem where the young child was. See, Barry Setterfield, The Christmas Star, DVD (2008) @ www.isetterfield.org; see also, Setterfield’s Technical notes on “The Christmas Star”. Evaluating Candidates for the Christmas “Star”? Taking the unresolved issues, proposed translations and differing interpretations of the Matthew 2 text into account (more>>), scholars have historically considered seven (7) things in evaluating whether proposed candidates for the Christmas “star” adequately explain and are consistent with the facts disclosed about the “star” in Matthew 2:1-11 (more>>). Many scholars (including Rick Larson and Barry Setterfield) propose the Magi (who are believed to have been from the area Babylon or Persia) were part of the legacy of Daniel and other Jews transported from Jerusalem to Babylon in 605 B.C. (more>>) As such, the Magi would have been aware of Daniel’s prophecy concerning the coming of an anointed one (a king of the Jews) around the time of Jesus’ birth (Dan.9:25). It is further proposed that because the Magi were pseudo scientists who engaged in astronomy, they would have been looking for a sign in the heavens of the coming of a Jewish king as prophesied by Daniel. If the Magi were aware of Daniel’s prophecy concerning the coming of an anointed one (a king of the Jews) around the time of Jesus’ birth (see, Dan.9:25 more>>), then any sign in the heavens which they believed depicted the coming of a king, may have indicated to them that the king of the Jews prophesied by Daniel had come. Based on the above, both Larson and Setterfield maintain there is good reason to believe the Magi would have associated the extraordinary astronomical events occurring in 3 B.C. – 2 B.C. with the Jews or the nation of Israel. Thereafter, on June 17, 2 B.C., nine months after the first time Jupiter (the King Planet) conjoined with Regulus (the King Star), which Larson notes is the term of a woman’s pregnancy, Jupiter had conjoined with Regulus two more times completing its “coronation” of Regulus. Although their presentations of the Jupiter proposal differ, both Rick Larson and Barry Setterfield maintain the symbolism the Magi observed in the heavens in 3 B.C. – 2 B.C. was sufficient for them to conclude a Jewish king had been born (Matt. 2:2). Because of the direction of Earth’s rotation (counterclockwise), all the stars (except those located at Earth’s poles, e.g., Polaris) appear to earthbound observers to rise in the east. The same is true of constellations, planets and comets. Did the events involving the Jupiter proposal appear at the time of Jesus’ birth (≈ 7 B.C. – 2 B.C.)? The events involving Jupiter (as part of a series of extraordinary astronomical events occurring in 3 B.C. – 2 B.C.) began as early as May, 3 B.C. and continued through December, 2 B.C. when it is proposed the Magi arrived in Jerusalem looking for the newborn Jewish king (Matt. 2:2). The period of May, 3 B.C. through December 2 B.C. fits nicely within the general 7 B.C. – 2 B.C.timeframe scholars have established for Jesus’ birth (more>>). Because the Magi met with Herod when they arrived in Jerusalem looking for the Jewish king (Jesus), Jesus must have been born before Herod died. Unfortunately, just as the date of Jesus’ birth was not recorded, the date of Herod’s death was not recorded. However, based on facts which were recorded by Josephus about things that occurred around the time of Herod’s death (e.g., there was a blood moon — a total lunar eclipse), scholars have narrowed the potential dates of Herod’s death to either 4 B.C. or 1 B.C. Matthew 2:16 states that after the Magi left Judea to return to their homeland, Herod “gave orders to kill all the boys in Bethlehem and its vicinity who were two years old and under in accordance with the time he had learned from the Magi.” (Matt. 2:7). Since Herod presumably issued the order to eliminate any potential threat to his throne by the newborn Jewish king (Jesus), then at least Herod believed Jesus was no more than two years old at that time. However, it is also possible that Jesus was less than two years old because Herod (a paranoid, murderous man who had his own sons put to death more>>) may have intentionally overcompensated the age covered in his infanticidal order to insure the threat to his throne was eliminated. With these considerations in mind, if Herod died in 4 B.C., Jesus would have been born about 1 – 2 years earlier around 5 B.C. – 6 B.C., not 3 B.C. – 2 B.C. as required by the Jupiter proposal. Although most scholars believe Herod died in 4 B.C., some scholars maintain the historical information recorded about things that occurred at the time of Herod’s death is more consistent with a 1 B.C. date for his death. For example, although a lunar eclipse occurred in both 4 B.C. and 1 B.C, the 4 B.C. 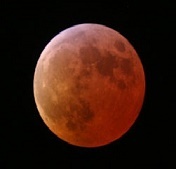 eclipse was only a 40% eclipse which would not have made the moon appear blood red as reported in the historical record. However, the 1 B.C. lunar eclipse was a total eclipse which would have produced a blood moon which is what the historical record states occurred around the time of Herod’s death. To further examine the reasons some scholars insist Herod had to have died in 1 B.C. rather than 4 B.C., see chapters 8 – 10 and 13 of Ernest Martin’s book entitled, The Star of Bethlehem — The Star that Astonished the World” which can be read free of charge at www.askelm.com/star/index.asp. Larson proposes it was only when the Magi explained how the extraordinary astronomical events as a whole signified the birth of a Jewish king, that Herod realized the significance of the events and became so troubled (Matt. 2:1-3) that he subsequently ordered the execution of all male children in Bethlehem who were two years old or younger in accordance with the information he obtained from the Magi about “exactly when the star appeared.” (Matt. 2:7,16). [See, Rick Larson, The Bethlehem Star, DVD (2007)] The infanticide of babies in and around Bethlehem which ensued following Herod’s order is commonly referred to as the “Massacre of the Innocents” more>>. Response No. 1 — The Astronomical Events Referenced in the Proposal Encompass More than Jupiter’s Conjunctions with Regulus and Venus: The unusual activity that occurred in the heavens in 3 B.C. – 2 B.C. was not limited to the conjunctions of Jupiter with Regulus and Venus. Some scholars maintain the events date back as far as May of 3 B.C. when Mercury and Saturn rose closely together before dawn and moved eastward toward Venus. The events continued through December, 2 B.C.when the Magi arrived in Jerusalem and discussed the events with Herod. May, 3 B.C. through December, 2 B.C. covers a period of about 19 months. Did the appearance of Jupiter (as part of a series of astronomical events occurring in 3 B.C. – 2 B.C.) go ahead of the Magi on their journey from Jerusalem to Bethlehem (Matt. 2:9) more>>? Based on Matthew 2:9, Larson and Setterfield agree that whatever the “star” (aster) was, it had to at least appear to the Magi that it was going ahead of them as they traveled south from Jerusalem to Bethlehem. Planets in the solar system (including Jupiter) orbit the Sun in elliptical orbits and are observed moving across the background of stars which remains relatively fixed. Because Earth is the third planet from the sun and Jupiter is the fifth, Earth’s orbit around the sun is significantly shorter that that of Jupiter’s. Whereas Earth orbits the sun once a year (or, once every 365 days), Jupiter orbits the sun once every 11.86 Earth years (or, once every 4,332 days). Earth ‘s average orbital speed of ≈ 67,000 mph (≈ 107,826 km/h) is also significantly faster than that of Jupiter which has an average orbital speed of ≈ 29,000 mph (≈ 46,670 km/h). As a result, Earth passes Jupiter on the “inside track” once every 398.9 days. Each time this occurs a very peculiar thing is observed by earthbound observers — Jupiter appears to reverse its normal eastbound course, travel backward (westward) for several days before stopping and then proceeding on its forward path again. Because of the great vastness of space, these movements are not observed over a period of hours, but over periods of days, weeks and months. Scientists now know these peculiar movements are an illusion caused by optical effects of retrograde motion. Criticism No. 1 — The Jupiter Proposal Doesn’t Account for How the Magi Knew which House Jesus Was in When they Arrived in Bethlehem: Matthew 2:9 says the “star” (aster) “stopped over”, “stood over” or came to “rest over” “the place where the child was.” Matthew 2:11 says that ‘[o]n coming to the house, they saw the child with his mother Mary…” Some scholars criticize the Jupiter proposal because it doesn’t explain how the Magi knew which house Jesus was in when they arrived in Bethlehem. Response No. 1 — The Text Doesn’t Say the Magi Followed the “Star” to a Particular House: Matthew 2:9 only says the “star went before the Magi until it came and “stood over” (ASV) or “came to rest” (ESV) “where the young child was.” The “where” could refer to the city of Bethlehem or some other more general location than the exact house Jesus was in. Some have proposed that upon arriving in the small town of Bethlehem, it wouldn’t have taken the Magi long to learn which house Jesus was living in. After all, Luke 2:8-18 reports that the night Jesus was born angels announced his birth to shepherds tending flocks in nearby fields. When the shepherds learned a savior (the promised Messiah) had been born in Bethlehem, they hurried into town and found Mary, Joseph and the baby lying in the manger. Luke 2: 16-18 says that after seeing Jesus, the shepherds spread the word about what the angels had told them about the child. Response No. 2 — The Shekinah Glory Could Have Guided the Magi to the Particular House Jesus was In: Barry Setterfield proposes that after the Magi arrived in Jerusalem, the same Shekinah glory that shone around the shepherds when the angels announced the Jesus’ birth (Luke 2:8-9) and led the children of Israel through the desert (Exodus 13:20-21), could have identified the exact house Jesus was in. Response No. 1 — Looking for Signs in the Heavens Isn’t the Same Thing as Engaging in Astrology or the Worshipping of Heavenly Bodies and Isn’t Prohibited by Scripture: Larson concedes that even people who are not of the traditional Christian or Jewish faith may feel uneasy searching for signs in the stars either because they have concluded there isn’t anything to astrology or it is something they are very leery about. “[Josiah] ordered Hilkiah the high priest, the priests next in rank and the doorkeepers to remove from the temple of the LORD all the articles made for…all the starry hosts. He burned them outside Jerusalem…. He did away with the idolatrous priests … — those who burned incense to Baal, to the sun and moon, to the constellations and to all the starry hosts.” 2 Kings 23:4-5. Job 26:13 states God set the stars and constellations in place and Job actually references some of the same constellations we are familiar with today. Peter challenged the skeptics he was preaching to on the basis that they knew these signs had occurred and Acts 2:41reports this evidence was compelling enough that 3,000 Jews came to believe Jesus was the Messiah on that day. …The heavens declare the glory of God; the skies proclaim the work of his hands. Day after day they pour forth speech; night after night they display knowledge. There is no speech or language where their voice is not heard. Theirvoice goes out into all the earth, their words to the ends of the world… (emphasis added). As contended by Larson, in writing Psalm 19 David chose verbs to relate the fact that stars actually communicate information. Rebuttal Point No. 1 — Psalm 19 Is Mere Poetic Symbolism: Some scholars maintain David was speaking in mere poetic symbolism when he wrote Psalm 19 and the passage says nothing about the stars actually communicating information. Rebuttal Point No. 2 — Psalm 19 Only Says the Heavens Declare God’s Glory: Although the Bible may indicate stars are for signs, it is unclear as to the kind of signs. Psalm 19 only says the heavens declare God’s glory, which is not the same thing as communicating information about the affairs of man. Response No. 1 — The Jupiter Proposal Focuses on One “Star” (aster) — Jupiter — and How that One “Star’s” Interaction with Other Astronomical Events Would Have Been Interpreted by the Magi: The Jupiter proposal focuses on one “star” (aster) — Jupiter (the king planet); but, the proposal explains how that one “star’s” interaction with other astronomical objects — e.g., Venus (the mother planet), Regulus (the king Star) and the Leo Constellation (the royal constellation) — would have been interpreted by the Magi (pseudo scientists and astronomers more>>) and why those events would have inspired the Magi to make the long journey to Jerusalem to look for a newborn Jewish king. Response No. 1 — The Conjunctions Were Close Enough to be Very Significant to the Magi: Even assuming Jupiter’s conjunctions with Venus in in 2 B.C. and 3 B.C. did not technically appear as single objects to a trained astronomer, their touching or unusual closeness would still have been very significant to the Magi. Because of the limited amount of information contained in Matthew’s account of the Christmas “star” (aster) (see, Matt. 2:1-11) and because there are areas of disagreement about how certain Greek terms and phrases originally used by Matthew are correctly interpreted and understood (more>>), many scholars and theologians caution against forming steadfast opinions about the precise nature of the Christmas “star” (aster). In the view of some biblical scholars, the “star” was a purely miraculous event and, therefore, no attempt should be made to provide an astronomical explanation for the “star”. Others maintain that if God chose an astronomical event to be a sign of the birth of his son (the savior of the world), it would still be miraculous because only an omnipotent and omniscient Creator like the God of the Bible (more>>) could have prearranged for the “star” (aster) to appear at the precise time in cosmic history when Jesus was born. Christian apologists and scientists holding to the later view have proffered a handful of astronomical explanations for the Christmas “star” (aster). As discussed in this article, one such astronomical candidate is that Jupiter — the King Planet (as part of a series of extraordinary astronomical events occurring in 3 B.C. and 2 B.C.) was the Christmas “star” (aster). Although there is no consensus in the Christian community regarding the precise nature of the Christmas “star”, because historically documented astronomical explanations have been offered which are consistent with facts recorded about the “star” (aster) in the Gospel of Matthew, Christian apologists maintain it is unfair for skeptics to insist the account of the Christmas “star” be dismissed as pure fiction. Hugh Ross, “The Christmas Star” (updated 12/02) (www.reasons.org, last accessed 11/4/2014). Slideshow Photo: This collage of photos, taken by ESO / Y. Beletsky shows the progression of a triple conjunction involving the moon, Jupiter and Venus. The collage shows the moon (the smallest object) rising from the left and proceeding to the right to conjoin with Venus and Jupiter (the largest object). The image was taken by ESO’s Very Large Telescope (VLT) observatory at Paranal in Chile. The image was downloaded from www.wikimedia.org which states the image is licensed under the Creative Commons Attribution 3.0 Unported (CC-BY-SA-3.0) license. 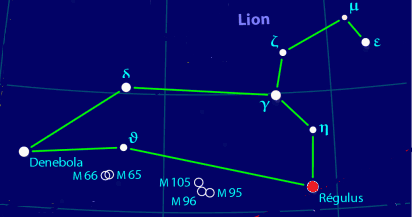 Leo Constellation: This image, which shows the star “Regulus” in the Leo Constellation was downloaded from www.wikimedia.org which states the image is licensed under the Creative Commons Attribution-Share Alike 3.0 Unported (CC-BY-SA-3.0) license. 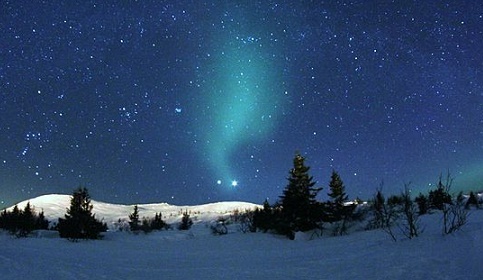 Jupiter–Venus Conjunction (2011): This cropped image of a rare conjunction of Jupiter and Venus was taken by Timothy Boocock in the night skies of Trysil, Norway. The image was downloaded from www.wkikmedia.org which states the image is licensed under the Creative Commons Attribution-Share Alike 3.0 Unported (CC-BY-SA-3.0) license. 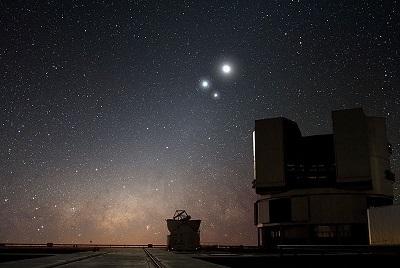 Venus, Jupiter Moon Conjunction: This photograph, taken by ESO / Y. Beletsky (http://www.eso.org/public/images/yb_vlt_moon_cnn_cc/) shows the December 3, 2009 conjunction of Venus, Jupiter and Moon over ESO’s Very Large Telescope (VLT) observatory at Paranal in Chile. The Moon is the highest object in the sky, Venus is the object shown to the left and Jupiter is the object to the right. The reddish glow on the horizon is the Milky Way. The image was downloaded from www.wikimedia.org which states the image is licensed under the Creative Commons Attribution 3.0 Unported (CC-BY-SA-3.0) license. Blood Moon: This photograph of a blood moon (aka a total lunar eclipse) which occurred on March 4, 2007 was taken by high school astronomy students at Alssundgymnasiet i Sønderborg in Denmark. The image was downloaded from Wikimedia.com which states the image was released into the public domain by the author. 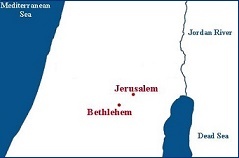 Map of Jerusalem and Bethlehem: The journey south from Jerusalem to Bethlehem is about 6.2 miles and is somewhat uphill as Bethlehem’s elevation is about 98 feet (30 meters) higher than that of Jerusalem. This rudimentary map was downloaded from Wikimedia.com which states the image was released into the public domain by the author, Wawaconia.